The stonefly genus of Pteronarcys could have come straight out of a Japanese monster movie taking on Godzilla in a fight to the death! Known regionally as the Salmonfly or Giant Black Stonefly, these massive nymphs of crawl out of the river each spring and are the size of a grown man's pinky finger. The burnt orange belly of the adult Salmonfly acts like a homing beacon to feeding trout as they launch themselves out of the water to feed on these truly impressive invertebrates. Needless to say, this hatch is one of our most eagerly anticipated of the year, and one that you should drop everything to fish when it hits a river near you! The Small Selection includes a total of 12 Salmonfly patterns and includes 6 wet and 6 dry patterns. The Large Selection includes a total of 24 Salmonfly patterns, and ensures that you are ready to do battle with trout on the river during this epic hatch! 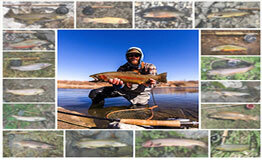 This selection includes 10 wet and 14 dry flies.